Shop our favorite new styles. In many areas of the US, the weather has oscillated 30 degrees in the last week alone, which makes getting dressed feel like a game of fashion roulette. Is it rainy and chilly, or humid and sweaty? Will that all change by lunchtime? Who knows! That’s why we’re proponents of the effortless and eternally cool jumpsuit—a one-piece wonder that comes in a variety of fabrics and finishes. You can layer it over a t-shirt and tie the sleeves around your waist if it gets hot, or top it with a beanie and zip it all the way if fall decides to show up. There’s no limit to the number of ways to style it, as evidenced by street style stars from New York Fashion Week. Check out our 15 favorites below. 1. 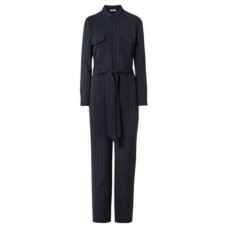 Ganni Clark Pinstriped Crepe Jumpsuit: It doesn’t get any more badass than a classic pinstripe, and of course, leave it to Ganni to make a truly epic version in the form of this jumpsuit. I can’t wait to wear it with some fresh white kicks and oodles of gold jewelry. 2. Caron Callahan Zip Foster Jumpsuit: I’ve been dying for a Caron Callahan jumpsuit ever since I spotted multiples colors in James Kicinski-McCoy’s Nashville closet. They’re especially utilitarian, which I adore, meaning I can jazz this up with some statement platform boots. 3. 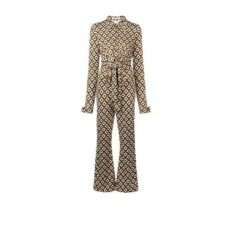 DVF Diane von Furstenberg Retro Print Jumpsuit: A ’70s-inspired jumpsuit that Pam Grier would be proud of. Sign me up. 1. 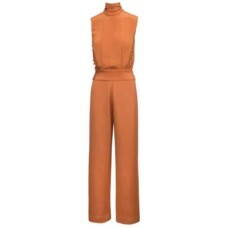 Kris Goyri Ezio Jumpsuit: According to all these pre-fall trends I’m seeing, orange really is the new black. 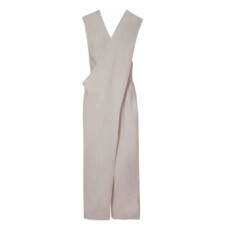 I love how this jumpsuit is sleeveless yet has a beautiful high neck. I also love the simplicity of the cut because you can easily pair it with different garments (like a long-sleeve lace bodysuit perhaps?) and elevate the look to another level. Plus, you don’t need to do much accessories-wise—this jumpsuit has it all ready for you. 2. 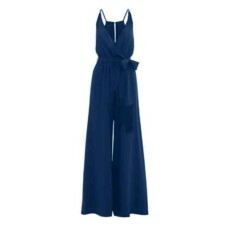 Paolita Navy Jumpsuit: Navy never goes out of style, and a V-neck always gives it that classic feminine touch. I also like how this jumpsuit cinches at the waist yet has bell bottoms. I’d wear this on a date night or to a fall wedding! 3. Sisa Linen Jumpsuit: Fact: Linen can be worn in the fall! 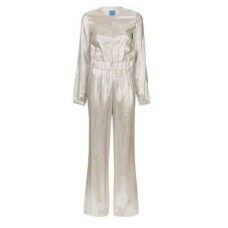 This creme colored jumpsuit is super minimalist, yet only really needs a few accents to finish the look. I like how the cut really accentuates any shape and can be worn in the summer and in the fall. Just add a long-sleeve turtleneck underneath and some patent leather booties, and you’re ready for the cooler months. 1. 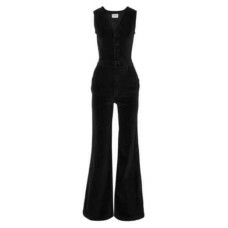 Macgraw Supernova Jumpsuit: I’ve been taking my fashion cues lately from the ’70s, from bell bottoms to platforms, and this jumpsuit absolutely fits the bill. Everything about this look—from its wide-legged pants to its silver silk material— screams ABBA. Tie the top around your waist and wear a casual white t-shirt to tone it down. Or it could just be worn as is, in all of its sparkly glory. 2. 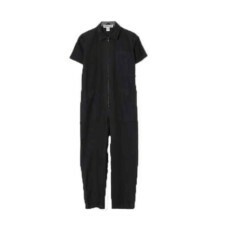 Rachel Antonoff Ziggy Jumpsuit: This jumpsuit feels like a traditional boiler suit, but with a twist. Polka dots seem to be a continuing trend that have been sprinkled around since NYFW fall 2018, so this can be a go-to piece in my closet. Still casual enough for me to run errands in but definitely a fun vibe, as always is the case with Rachel Antonoff designs. 3. 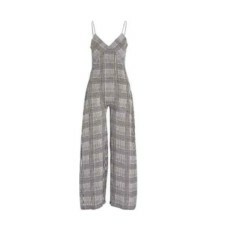 Fleur Du Mal Wide Leg Jumpsuit: Plaid for fall? Groundbreaking. 1. Ernest Leoty Black Corset Shortie: OK, OK, so this may not be the best option for transitional dressing, but you better bet I’ll wear it on the warmer days with a jacket over top, or to the gym (like it’s meant to be). Personally, I think it’s the most luxe piece of workout wear I’ve ever seen, and I’m so here for it. 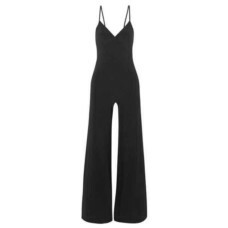 2.Norma Kamali Stretch-Jersey Jumpsuit: If a jumpsuit is made out of a stretch jersey, I’m all the way for it (my goal is to always be cozy). This black number looks so incredibly comfortable that I would happily wear it to a dinner or a night out. 3. Area Lamé-Trimmed Jumpsuit: This jumpsuit somewhat reminds me of a racing suit, and truthfully, that’s what made me fall in love with it. I’m already picturing myself wearing it with a pair of fresh white sneakers, but honestly, you could pair it with pretty much anything. 1. 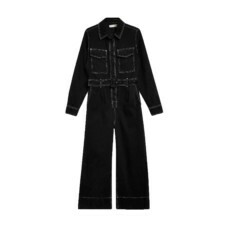 Top Shop Contrast Denim Boilersuit: I practically wear an oversized denim jacket with everything, so why not turn it up a notch with this full denim jumpsuit? Considering winter is about to hit NYC hard, this will keep me completely warm and looking chic while at it. I’m already daydreaming about the white Stuart Weitzman booties I will pair with it. 2. 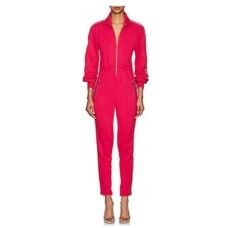 NSF Stasia Sweat Jumpsuit: This is the ultimate cozy girl fit. This jumpsuit gives you loose sweat-suit vibes but is also fitted (and cute!). It’s perfect to wear on an errand day with a pulled-back bun and sunglasses. 3. Frame Velvet Jumpsuit: The ’70s were definitely an inspiration this fashion week, and honestly, I am here for it. I love the versatility of this jumpsuit because you can wear layers underneath or wear your arms completely out.